Here, in 1978, the last of the "old-fashioned drug stores” in junction City closed. Built in 1904 by pharmacist C.H. 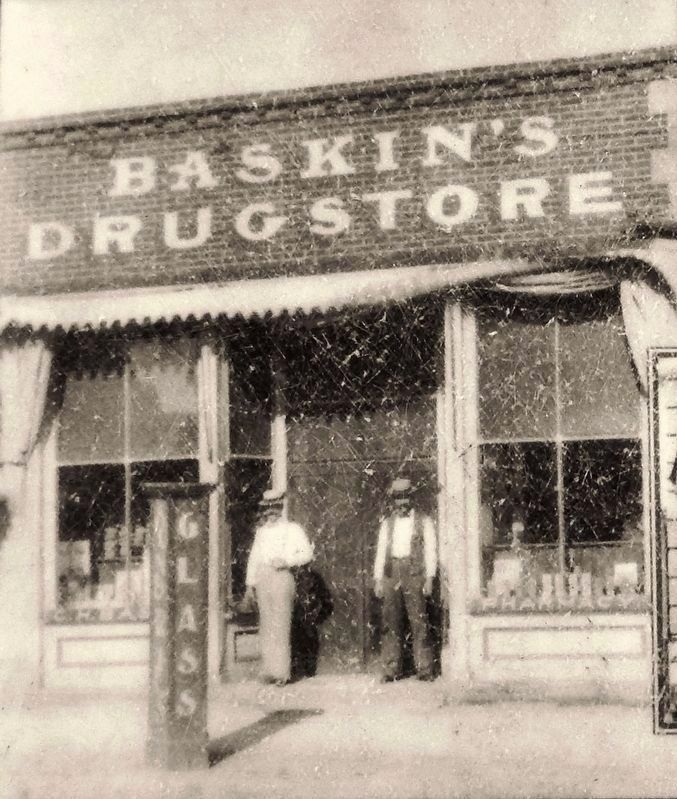 Baskin, the building was acquired by Charles Clewell in 1917. Eventually his son, Roy Clewell, became the proprietor. Sumner W. Pierce founded the Central National Bank in 1884. In 1910, he erected the main bank building on the northwest corner. Pierce added a stone building on the north side in 1911, and on the west side, also in 1911. 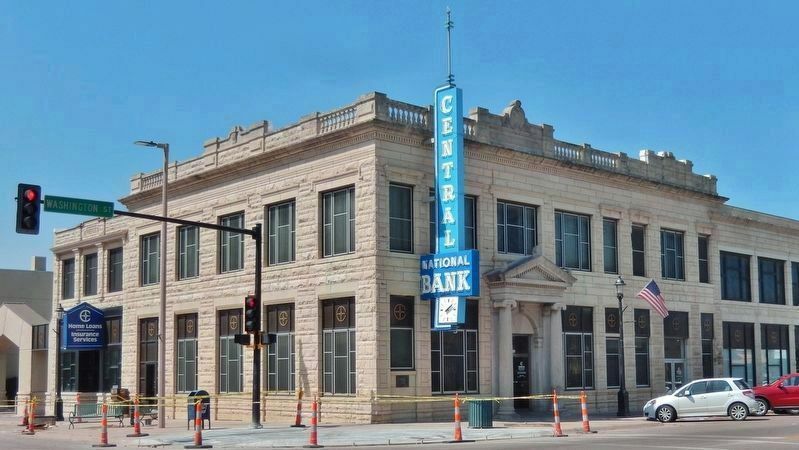 The Central National Bank continues to operate from the building. Strength has been one of the main-stays of the Central National Bank through its 100 year history. It has gone forward in a positive fashion from its youth to maturity. Even in the worst of times — the Great Depression, the Bank Holiday, and even inflation - it was a viable source to the community it serves. the bank had to “crawl" before it could "walk." The "crawling stage" lasted about 40 years but even in those years, the bank never lost its capital base — the main spoke in any bank’s wheel. We have grown from the darkest days of the 1930’s, when management struggled to keep the doors open, to our present-day strength ranking in the top 5% of the nation’s banks. During the first 40 years, many banks were formed, but many were lost. During 1930, more than 1,300 banks closed their doors and by 1933 an additional 7,000 had failed. Only the strongest survived and remain today. J.J. Pennell was a well-known photographer in Junction City between 1886 and 1922. In 1908, he built this building which housed the Miller Drug Co. downstairs and his photography studio upstairs. It was here that Joseph Stanley Pennell wrote his novel of Junction City and the Civil War, "The History of Rome Hanks," a best seller in 1944. "Pennell 1908" can still be seen atop the building. 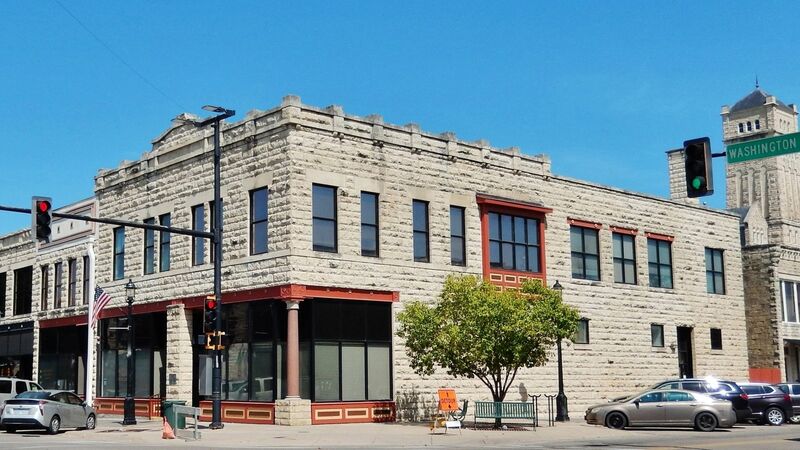 The building was restored and dedicated in 1997 by Geary County and currently houses offices of the Geary County Attorney and other court services. Photos courtesy of Geary County Historical Society. W. Marker is in Junction City, Kansas, in Geary County. Marker is at the intersection of North Washington Street (Alternate U.S. 77) and East 8th Street, on the right when traveling north on North Washington Street. Touch for map. Marker is located along the sidewalk at the southeast corner of the intersection, facing north. Marker is at or near this postal address: 725 North Washington Street, Junction City KS 66441, United States of America. Touch for directions. Other nearby markers. At least 8 other markers are within walking distance of this marker. 700 Block Washington Street (here, next to this marker); 7th Street East & West of Washington (about 300 feet away, measured in a direct line); 600 Block Washington Street (about 300 feet away); George Smith (about 400 feet away); Civil War Memorial Arch (approx. 0.2 miles away); State of Kansas Vietnam Veterans Memorial (approx. 0.2 miles away); Purple Heart Memorial (approx. 0.2 miles away); 1st Infantry Division Memorial (approx. 0.2 miles away). Touch for a list and map of all markers in Junction City. order to provide depositors the greater safety offered by a national bank. More. 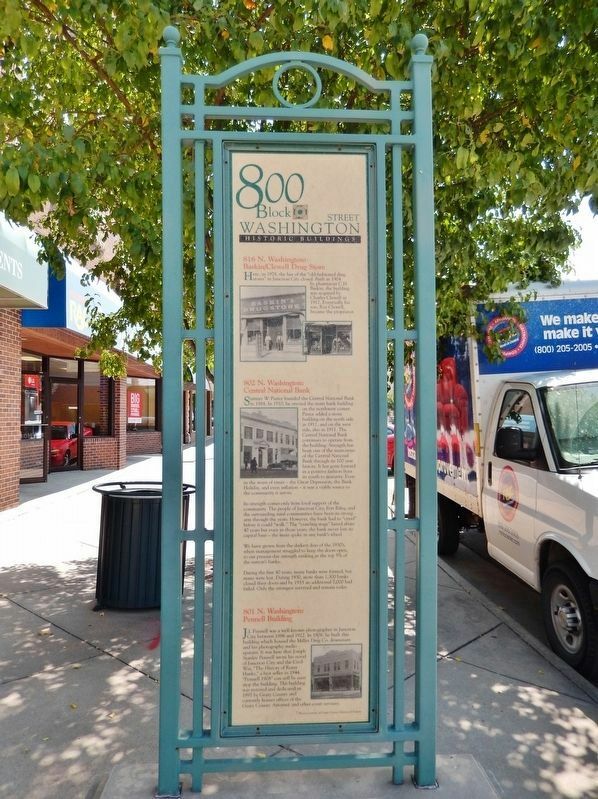 Search the internet for 800 Block Washington Street. Credits. This page was last revised on March 30, 2019. This page originally submitted on March 29, 2019, by Cosmos Mariner of Cape Canaveral, Florida. This page has been viewed 48 times since then. Photos: 1. submitted on March 29, 2019, by Cosmos Mariner of Cape Canaveral, Florida. 2, 3, 4, 5. submitted on March 30, 2019, by Cosmos Mariner of Cape Canaveral, Florida.